Of the many genres out there available for our consumption, the zombie film holds a very special place in our cinematic diet. It is actually a subgenre, being an offshoot of horror but, just like the vampire film, it as been allowed to ascend to its own autonomous position, to be taken into consideration separately from its parent. Naturally, this comes with particular set of problems. Zombie films occupy a very narrow field within the medium. As potent as the concept can be, it only encompasses a specific set of tropes and narrative devices which have arguably survived long past their sell-by date. George A. Romero set off the genre in the late 1960s with Night of the Living Dead but 35 years later his own efforts have begun to look tired and recycled. 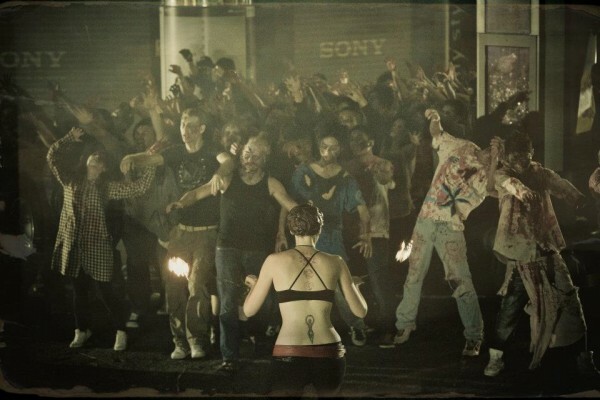 In fact, the most popular zombie films of the last few years have arguably been comedies which poked fun at the genre, such as Shaun of the Dead (2004) and Zombieland (2009), as well AMC’s series The Walking Dead, which employs the novel approach of following a zombie narrative in longform. So when Taiwan announced its first foray into the genre with Zombie 108, was this ever something to get excited about? One surface value it looks as though the feature is following the right track by placing its tongue firmly in cheek and tossing a few other tropes like gangsters and a serial killer into the mix. To be honest I came to the film with particularly low expectations, having only heard bad things about it. Sadly, these criticisms appear to be completely justified. Zombie 108 is a mess, plain and simple. It is badly made, schlocky, misjudged, unbalanced and woefully cast. Of course all those elements could potentially gel into an enjoyable b-movie worth sitting down to and laughing at, but this film just winds up being a desperate bore. More worrying, is that it is also offensive, to a degree that made me uncomfortable. It is violent, which is fine, but its aggression, especially in its most wanton circumstances, is directed towards woman with a degree of maliciousness and borderline hatred that upset me. On that basis alone I would warn you against this film but there are plenty more reasons why you shouldn’t waste your time on this. As others have mentioned, it is remarkable to witness so many poor decisions in such a short running time. The film makes almost no sense and doesn’t really seem to begin or end. It veers from one poorly thought out vignette to the next, with little rhyme or reason. It lacks a cohesive story, characters, scares, production values and just about anything that you consider important in a film. The only thing that marks it at all is its attitude: it is misogynist, apathetic and clearly demonstrates that the filmmakers couldn’t give a damn about their audience. Do yourself a favor and skip right past this one. In fact, try to forget that I even mentioned it.